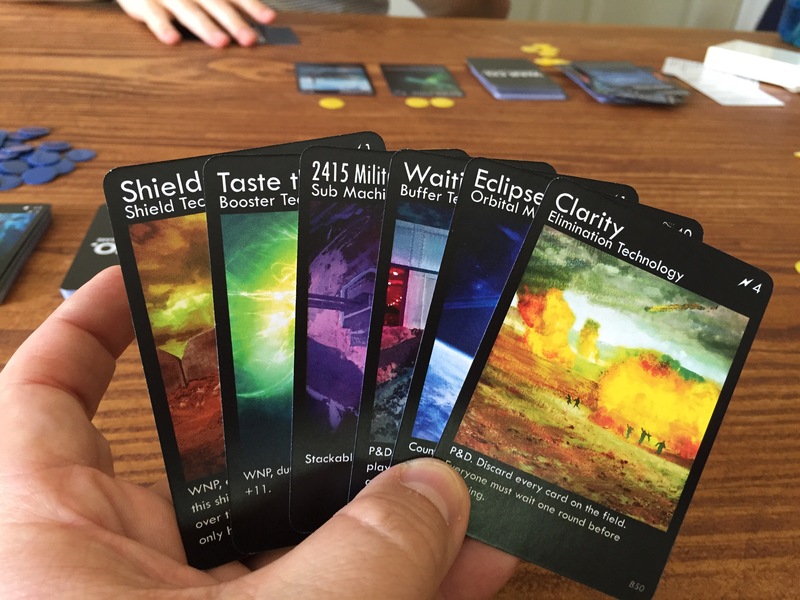 War Co. is an expandable card game about war, scarcity, and making hard choices. The objective: run your opponent out of cards. Survive. 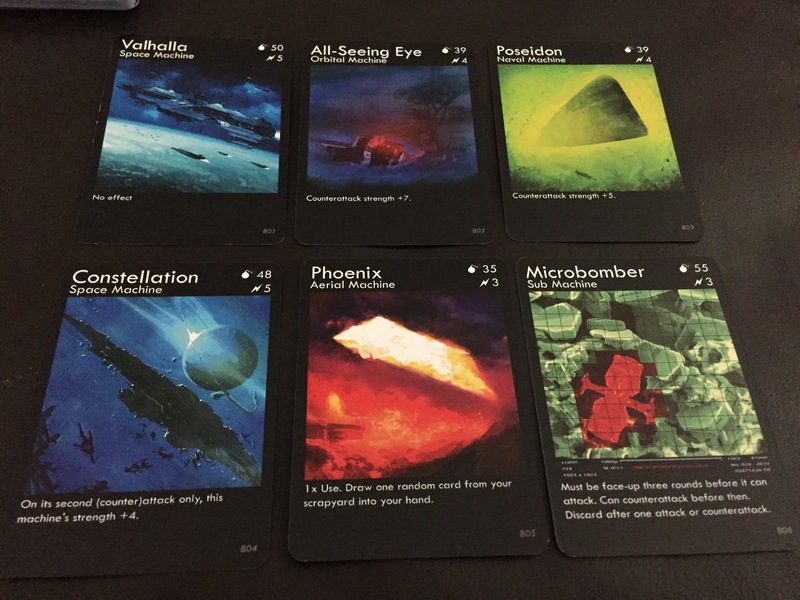 A few weeks ago, I reached out on Twitter to Brandon Rollins, the designer of the War Co. Expandable Card Game. I wanted to see if he would be interested in providing our blog the opportunity to play his new game and do a review. Because we are new, only having started our blog in April, I didn’t expect him to even respond much less agree to send me a copy of his not yet released game to play and review. But, to my surprise he agreed to send us a review copy of the game, which only included 2 of 6 decks. We got the Bruiser and Conspirator decks, one built for raw power and the other to be played with a little more finesse and sneakiness. More on the gameplay and strategy later. I opened the meticulously packed and well protected envelope (this told me a little about Brandon in the fact that he cared greatly for his game and wanted to make sure I got it in pristine condition so I could come to feel about it as he did! Read his story here to understand what I’m talking about: http://warcothegame.com/the-long-story-of-how-war-co-came-to-be/) to find a very unassuming game inside. This was a first impression that in this instance was flat out wrong! 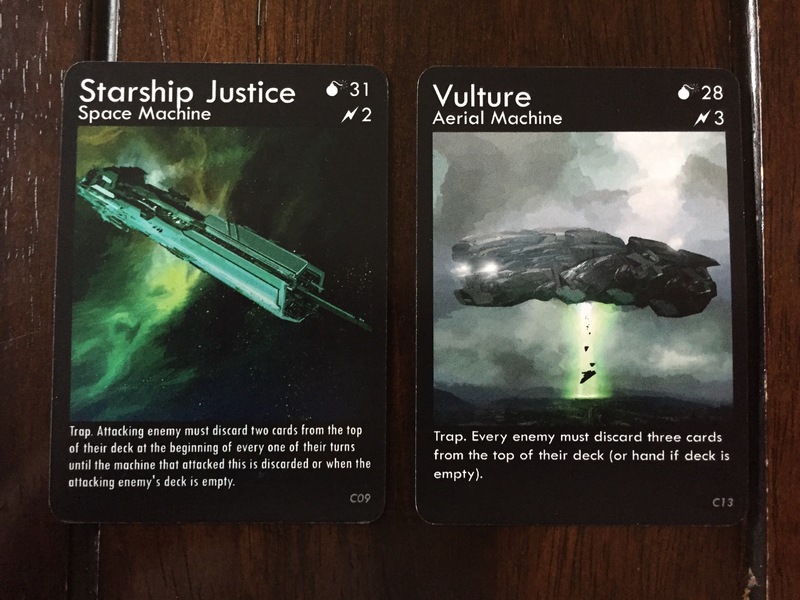 The cards have a fairly simple design and layout. In my opinion, this is a good thing! Simple allows the gameplay to shine through and not be overshadowed by a fancy layout and cluttered, wordy explanation. The card backs are jet black with the simple War Co. logo written out in block text. 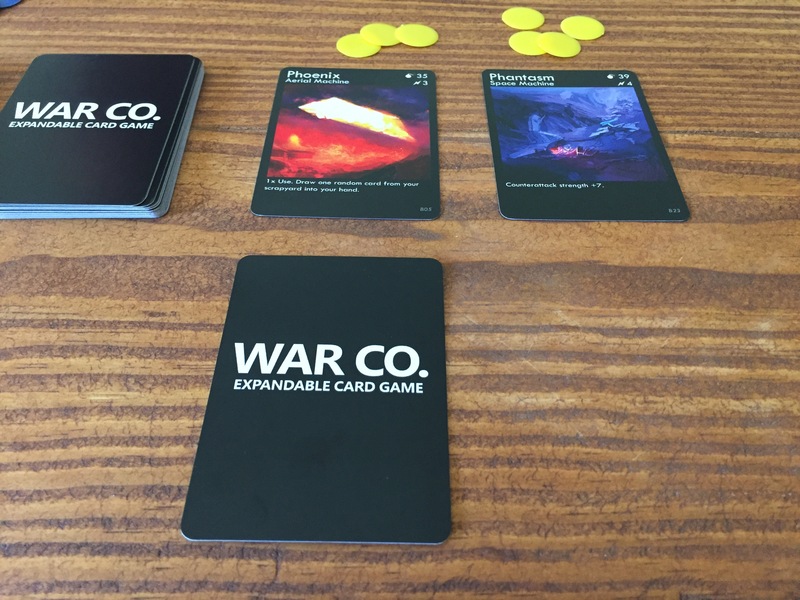 War Co. is an expandable card game that means it can be added to in the future to enhance existing strategies, develop new strategies and explore new concepts and mechanics. The best thing about this design is that it is fairly simple and straightforward. The rules are included on 2 sheets of paper printed both in the front and back but the rules don’t get in the way of the game. What I mean by this is the rules are clear, concise and intuitive. There are phases including Draw, Place, Attack and Discard and procedures to follow that don’t change over the game and don’t get more complex as you play. To quote the designer from Twitter “My philosophy in War Co.: let the complexity come from the cards’ relationships…not the rulebook.” What I found in our limited plays was that there are definite combinations designed into the decks that you must discover and exploit in order to be victorious and the simplicity of the rules allow you to focus on developing these combinations rather than spending time and energy being a “rules lawyer”. The game is made for up to 6 players to play at a time with each controlling their own 50 card deck (the decks will be at 50 cards for 2 players but 5 cards will be removed for each additional player). The goal of the game is to eliminate your opponents deck which represents their life. Simple. Straight forward. This is done through a series of attacks on the other player or his machines. Plus, at the end of each round each player must discard a card from their hand or a technology that was played to the field. Each player starts with 10 energy that must be used to power cards that are played to your field. Each card has a listed energy value. To me, this is the true crux of the game. Energy management will determine what you can and can’t do throughout the game. Spend too much energy too early, and you won’t be able to play the cards you want later. There are only 2 types of cards including machines and technology. Machines can attack. They’re your offense and defense. Technologies can’t attack. They change the rules of the game and provide you benefits. Pretty simple….and remember that is a good thing! As mentioned above, attacks are either direct or indirect. You can only attack once per turn. You attack only one target player or machine of your choice with only one machine each turn. Simple. There are two types of attacks. Direct Attacking: Your enemy has no machines on the field. They have to discard 3 cards from the top of their deck. This is rare but is very good for the stacker and bad for the defender. Indirect Attacking: Your enemy has at least one machine on the field. If your machine is stronger than its target, the target is destroyed. The enemy has to discard 1 card from the top of their deck. If your machine is weaker than its target, you lose the attacking machine plus you discard 1 card from the top of your deck. If both machines are equal in strength, both machines are destroyed. No one discards from their deck. If you’re attacked and your deck is empty, you have to discard from your hand. WNP: “While in play.” Card has a continuous effect that lasts while it’s face-up on the field. 1x Use: “One-time use.” Only listed on machines. Card’s effect is used once and does not have to be used immediately. P&D: “Play and discard.” Only on technologies. Play the card, use its effect immediately, then discard. You can still discard another technology during your Discard Stage. Counterattack: The machine targeted by an attack is “counterattacking.” Sometimes counterattacks have a different strength. Trap: Only on machines. Trap effects automatically take place when the machine is attacked and destroyed by a stronger machine. Nothing really complex about that. Simple. This is the central strategy to the game. With limited resources, both limited by a 10 energy threshold as well as only 5 cards on the field at once, including 3 machines and 2 technologies, you must make tough choices about how to spend those resources to get the best return for your investment. Many times I’d look at my hand and say “Ooh, I want to play that machine!” or “That technology is exactly what I need to play to get out of this mess!” But, I wouldn’t have enough energy or spaces on my field. Just like real life we have unlimited wants but finite resources. 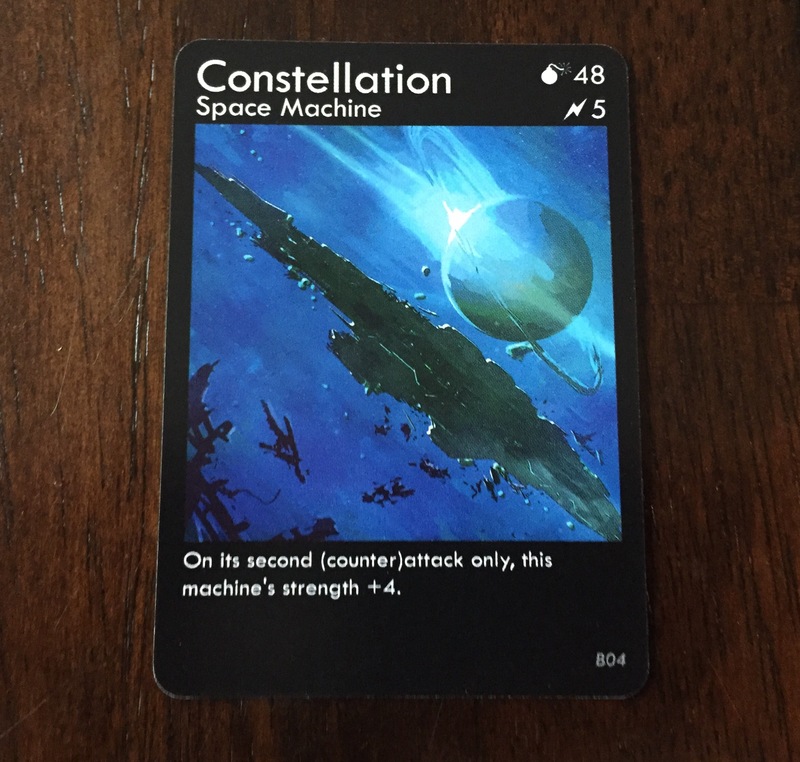 What do you mean I can’t play this super awesome & powerful Constellation Space Machine? I have 4 energy available! But it costs 5? Maybe I can pay with my credit card? For strategy, you can opt to play any card face down on your field. It must be located in the appropriate slot, either machine or technology, but you don’t have to pay the energy cost until you activate it! We found this tactic to be very effective in delaying attacks or changing the plans of your opponent. It also was a fun part of the game. Sometimes, if the card wasn’t good for the situation or useful, I’d just play the card facedown for the psychological effect it had on my opponent. What devious trap awaits my opponent? Playing cards facedown is a very strategic part of the game. Certain cards are marked with the keyword Trap and gain power from being played facedown on the field (see explanation above). These traps do several things from blocking attacks to forcing discards from the top of your opponents deck. Remember, getting rid of their cards is the way to win. I would love to see the other types of traps used in the other 3 decks. 4. Puzzle to Figure Out. One aspect I also enjoyed was trying to figure out the cards I needed to defeat my opponents set up. 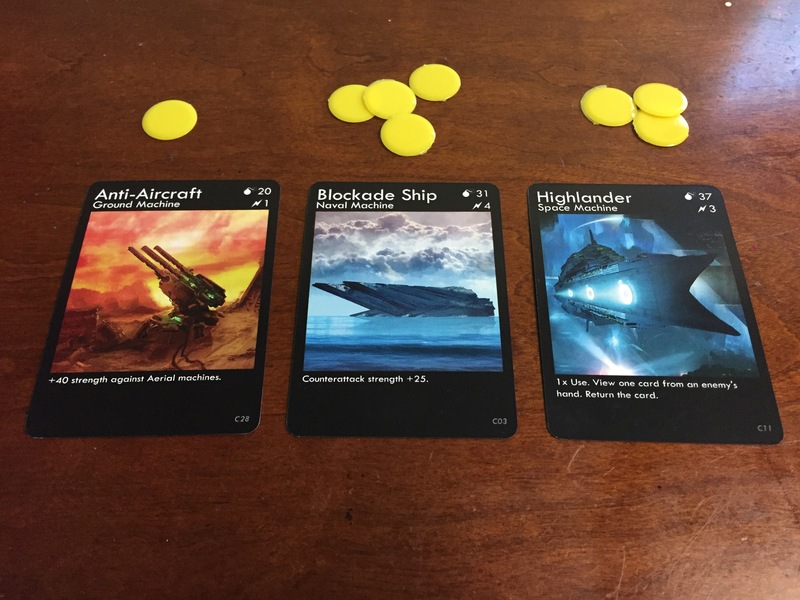 As you see from the photo below, my opponent had a very overpowered Blockade Ship Naval Machine in play with a strength of 56 when counterattacking, a good attack against Aerial Machines in the 60 strength Anti-Aircraft Ground Machine and a solid Highlander Space Machine with a 37 strength. Not a perfect defense but one that made me think about what I needed to play to overcome their strengths. The great thing about this though is that once you get around the current defenses, more will follow with a new combination of machines and technologies to vex you. Great part of the game! The best part of the cards though is unquestionably the art! The art is done masterfully by James Masino, who I fear is only being paid in cards (an inside joke from Twitter!) His elegant drawings of various machines of war, death and destruction that are envisioned in the 27th century are a thing of beauty. Each card has a vibrant color pattern that is complemented by hard lines and images that readily transmit to the eye of the beholder the size and majesty of these gargantuan futuristic machines. Sometimes games try to do too much. Adding cool and innovative mechanics that simply add to the games complexity without adding to the ultimate purpose of the game which should be enjoyment by the players. This game is simple, and this is intended as a complement. The rules are easy and intuitive, the goal is clear and the mechanics are as simple as 1, 2, 3! I love this part of the game. I also love that it can be played in 30-40 minutes for 2 players. That is very refreshing in our day when games add play time only to seem important and sophisticated. Don’t get fooled. Simple is in my opinion desirable! 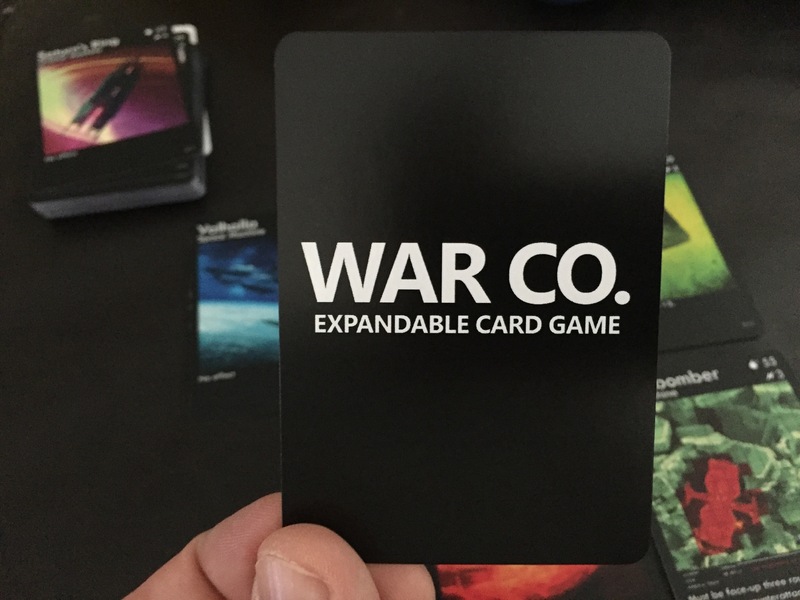 I am impressed with War Co. Expandable Card Game. This is a good game, plain and simple. After playing, I can tell it is well thought out, designed and put together. I also personally love Sci-Fi and this game is most definitely that. One other comment about the gameplay, in my 2 games the end amount of cards was very close with both victories for me. That is a sign of balance and comes only from hours of play testing to get it right. I would definitely recommend this simple, yet well thought out and surprisingly tactical game of dueling. Look for it on Kickstarter over the next several months and look for an interview with creator Brandon Rollins on our blog in the near future. Alexander and Tim will also share their thoughts and perspective on the game in their own posts. Nice job on the review. You give a clear description and I feel like I know how the game works now. Sounds like a fun game, especially for those of us that appreciate simple rules.